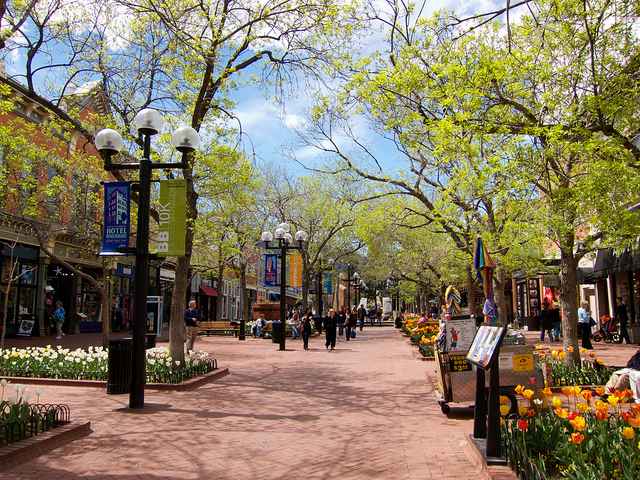 Boulder, Colo. is the U.S. metropolitan area with the happiest residents, according to a 2010 Gallup and Healthways survey. Photo by Shihmei Barger. The design and condition of cities are associated with the happiness of residents, a recent study concludes. Conducted by a joint research team from the University of South Carolina and West Virginia University, the study examined 10 urban areas to find that cities with access to convenient public transportation and cultural and leisure amenities promote happiness. The study also determined that urban areas that are more affordable and function as healthy environments to raise children are linked with happier residents. These latter two urban elements foster happiness by promoting positive social connections, the researchers suggest. The study, “Understanding the Pursuit of Happiness in Ten Major Cities,” was published in the Urban Affairs Review. Boulder, Colo. was ranked as having the highest Well-Being Index score in a 2010 Gallup and Healthways survey. The 4th ETSI Workshop on Intelligent Transport Systems (ITS) begins tomorrow in Doha, Qatar. The theme of this year’s event is safe, smart and sustainable traffic through cooperative intelligent transportation systems. The workshop offers a forum for participants to share Cooperative ITS expertise made globally. “The field of Cooperative ITS, as evidenced by the tremendous global attention to car-to-infrastructure and car-to-car communications, will undoubtedly re-shape the future of ITS in the years to come,” said Executive Director Dr. Adnan Abu-Dayya of the workshop’s host organization, QU Wireless Innovations Center (QUWIC). The three-day event includes more than 30 speakers from around the world.